The Father Gaschon - Association "Les Amis du Père Gaschon"
Missionary Priest of the Diocese of Clermont in Auvergne. A Priest of Peasant Origin. Ordained in 1756, François’s first post is assistant at Saint-Amant-Roche-Sevine. In 1758, he goes to Toulouse, where he does a degree in canon law. He then becomes assistant to Fr Chambrotty in Olliergues; the attention to the poor of this parish priest, four years his elder, would have a profound influence on the young priest. Auzelles, vu de la route de La Molette. A Missionary Risking his Life. In 1766 François decides to become a diocesan missionary He does his noviciate at Notre Dame de l’Hermitage, in the Monts de Forez; afterwards he lives, alternatively, in this house and at Notre Dame de Banelle, in the Bourbonnais. The missions that he effected in the region are still famous, as much for their apostolic zeal, as their ability to pacify various sorts of conflicts. The missions were interrupted in 1792 by the Revolution, and the missionaries where dispersed. Determined to refuse all oaths, Fr Gaschon begins a clandestine ministry in the area around Ambert and Olliergues: he teaches the faith, administers the sacraments,brings encouragement to persecuted peasants , and avoids capture, sometimes comically, sometimes, miraculeously. After La Terreur , he becomes again, assistant priest at Olliergue. 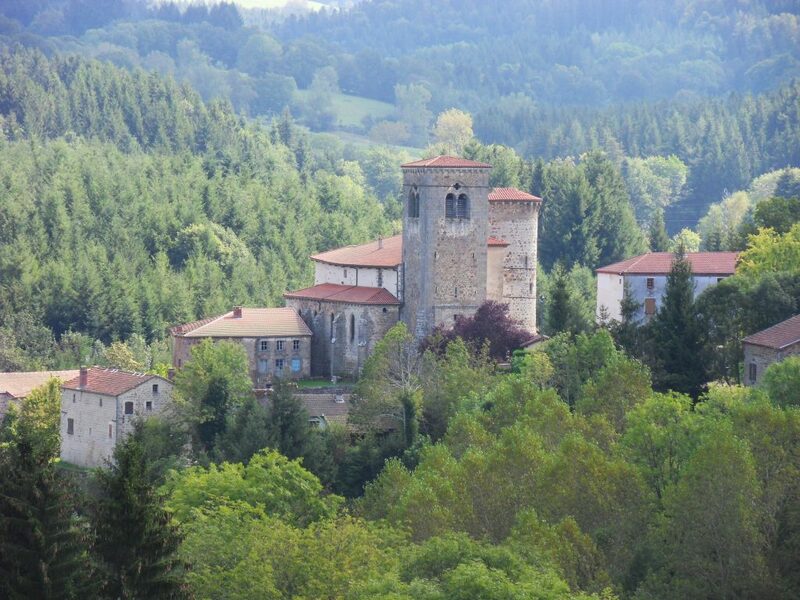 On the death of Fr Chambrotty in 1804, the good Father is called to Ambert by the new parish priest, Fr Rostaing, who puts him in charge of catechism; but even though in his seventies, Fr Gaschon is also very active in the Ambert countryside- preaching, confessing, visiting the sick and bringing peace and reconciliation to these troubled times. At the end of 1806, Fr Gaschon, having refused, in his deep humility, all honours, becomes chaplain to Ambert Hospital. He takes up his post, poor among the poor, becoming a real father to all the sick and the orphans that were welcomed there. It was there, that dies on 28 November 1815, loved and venerated by all, he who had always remained a missionary in spirit. He was buried in the hospital chapel, before a huge crowd of people. Straight after his death, his saintliness was established, accompanied by a large number of witnesses to miracles.His tomb became a place of pilgrimage and to this day he has granted many favours. Among the important aspects of his spirituality, note his ardent devotion to the Sacred Heart of Jesus, his faith in Our Lady of Seven Sorrows, which goes back to his childhood, as well as his fondness for the poor and his missionary spirit that never left him. Prayer found on an old picture of Fr Gaschon. Prayer asking for the glorification of the Venerable Servant of God. Three times: Cor Jesu Sacratissum, Miserere nobis, Sacred Heart of Jesus, have mercy on us. Prayer on a recent picture of Fr Gaschon. Prayer to obtain the beatification of the Venerable Fr François Gaschon. God, Our Father, You that “raises up the humble” we give thanks for the life of the Venerable Fr François Gaschon. In the midst of trials that he had to endure, he was, among us, by imitating Jesus, a model of faith, of hope and of charity. Please reveal his saintliness by according me the benefits that I need. Please let the Association or the Postulator know of any graces received by the intercession of the Venerable Servant of God.